For some reason today’s news made me think of this famous old record by Bunk Johnson. Bunk Johnson was born in New Orleans way back in 1879 and he made his name playing trumpet in the very early days of jazz, including – if his own account can be believed – a stint with the legendary Buddy Bolden. He was regarded by many, including Louis Armstrong no less, as one of the top trumpeters in New Orleans in the period between 1905 and 1915. Jazz had begun with the marching bands that performed in New Orleans but then largely moved into the bordellos of Storyville, the biggest (legal) red light district in the history of the United States. When Storyville was closed down in 1917 most professional jazz musicians lost their only source of regular income. However, a few years later, in 1919, the United States Senate proposed the 18th Amendment to the Constitution which prohibited the manufacture, distribution and sale of alcohol for human consumption and ushered in the era of Prohibition. This turned Chicago into a bootlegger’s paradise and jazz musicians flocked there to perform in the numerous speakeasies. That’s why the great New Orleans Jazz records of the 1920s were all made in Chicago and it also caused the music to evolve in new directions. Bunk Johnson did not join the mass exodus to Chicago and his career faded into obscurity, ending entirely in 1931 when he had his front teeth knocked out in a brawl and could no longer play the trumpet. However, in 1942, Bunk Johnson was rediscovered as a very old man by some young jazz fans who travelled to New Orleans and recorded him playing with a band of local musicians in the basement of a house courtesy of a new set of dentures. Despite the poor sound quality of the recording, the resulting tracks proved incredibly popular, ushering in the New Orleans Revival that began in the United States and then propagated across to Europe after the war to the extent that many revivalist bands even sedulously acquired the “recorded-in-a-garage” sound. Bunk Johnson passed away in 1947 but George Lewis, who plays clarinet on this track, carried the flag for “authentic” New Orleans jazz for many years after that, visiting Europe on many occasions. My Dad played the drums with him a few times..
P.S. I’ve always felt particularly sorry for Walter Decou, who played piano on the famous Bunk Johnson records of 1942, because apparently he was pounding away like a good ‘un but you can barely hear a note from him on any of them! Fat Tuesday – Eh La Bas! Today’s the day we call in England Shrove Tuesday. We’re apparently all supposed to get shriven by doing a penance before Lent . Another name for the occasion is Pancake Day, although I’m not sure what sort of pennance it is to be forced to eat pancakes. Further afield the name for this day is a bit more glamorous. Mardi Gras, which I translated using my schoolboy French as Fat Tuesday, doesn’t make me think of pancakes but of carnivals. And being brought up in a house surrounded by Jazz, it makes me think of New Orleans and the wonderful marching bands that played not just during the Mardi Gras parades but at just about every occasion for which they could find an excuse, including funerals. The Mardi Gras parades gave rise to many of the great tunes of New Orleans Jazz, many of them named after the streets through which the parade would travel, mainly in the famous French Quarter. Basin Street, South Rampart Street, and Bourbon Street are among the names redolent with history for Jazz fans and musicians around the world. I also remember a record by Humphrey Lyttelton‘s 1950s band called Fat Tuesday. I saw this clip a few days ago, and had it in mind to post it at an appropriate time. Unfortunately when I got home today I learned some news that makes today seem all too appropriate. 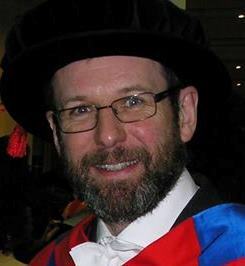 A distinguished and respected colleague, Prof. Steve Rawlings, of Oxford University was found dead last night. This is shocking and desperately sad news. I have no idea what happened but apparently the Oxfordshire police have arrested a 49-year old man on suspicion of murder. No doubt more information will emerge in due course. The connection between this sombre piece of news and the clip I intended to post should become obvious when I tell you that it depicts a funeral. Indeed the music featured, the hymn or spiritual Just a Closer Walk with Thee, was the main music chosen for the service when my father died, just over four years ago. It’s a lovely old traditional tune that often plays a central role in New Orleans style funerals, as shown here, and is a melody that, for me, has a deep associattion with loss and bereavement. The clip is taken from the US TV series Treme. I haven’t seen Treme -if it has been shown on UK TV I missed it – but it’s set in New Orleans in the aftermath of the near destruction of the city by Hurricane Katrina in 2005. Not knowing anything about the TV series I only watched the clip because of the music, but I was mightily impressed by the way the scene was photographed and how careful the producers had been in getting the details just right, because a funeral in New Orleans is unlike any other. The sashes, parasols, and exaggerated, swaying slow march seen in the film are in some sense almost comical, but they are also at the same time solemn and immensely dignified. Defiant, even. I don’t think it’s just because I am a jazz fan that I find this video so moving. Perhaps it’s really because, faced with the awesome finality of death, every action we take in life is comical anyway, just as every word is ultimately banal. However, if a farce is what it’s going to be, let’s just make sure it’s done the way we like it – especially at the end. Amen to that. I don’t think Steve Rawlings was a jazz fan, but this is the best way I can think of to pay my respects. It’s thoroughly wet and miserably cold – especially considering it’s meant to be summer – so I’ve been looking around for something to brighten up the evening and chanced upon this piece of traditional jazz which did the trick for me. This is the kind of New Orleans style jazz band my Dad used to play the drums for, and the tune is one I actually learned to play on the clarinet so I could sit in with them once or twice so it brought back quite a few nice memories hearing it just now. It’s based on an interesting 16-bar blues theme (in contrast to the usual 12-bar variety) that was ubiquitous in early jazz, appearing in a number of different tunes. In this particular manifestation it’s called The Girls Go Crazy (About the Way I Walk). It’s neither a famous band nor a famous recording, but I bet everyone who was there that sunny day last year in San Francisco thoroughly enjoyed the occasion, especially the band! Being a bit busy last week I didn’t have time to celebrate Mardi Gras or, as it’s known here in Britain, Shrove Tuesday. I was fresh out of shroves last Tuesday anyway. Last year at this time I blogged a bit about Mardi Gras parades in New Orleans, the home of Jazz and that came to mind again when I found the following clip on Youtube. It’s from an experimental film made in the 1950s called Cinerama Holiday which involved shooting the film using three cameras and projecting the results onto a curved screen to make the viewer feel in the middle of the action. There was also an early attempt at surround sound. Interesting though this is as a bit of film history, the thing that caught my eye was the little bit of Jazz history it captures. Jazz began with the marching bands that performed in New Orleans but then largely moved into the bordellos of Storyville, the biggest (legal) red light district in the history of the United States. When Storyville was closed down in 1917 most professional jazz musicians lost their only source of regular income. However, a few years later, in 1919, the United States Senate proposed the 18th Amendment to the Constitution which prohibited the manufacture, distribution and sale of alcohol for human consumption and ushered in the era of Prohibition. This turned Chicago into a bootlegger’s paradise and jazz musicians flocked there to perform in the numerous speakeasies. That’s why the great New Orleans Jazz records of the 1920s were all made in Chicago and it also caused the music to evolve in new directions. However, not all Jazz musicians left New Orleans. Many stayed there and kept the music going in authentic style. One of the characters who did so was the legendary Oscar “Papa” Celestin who led various bands through the 20s and 30s, including one called The Original Tuxedo Jazz Orchestra. Everything was an orchestra in those days, come to think of it. These bands kept going through the depression but never really achieved great commercial success until the traditional Jazz revival of the 1950s. It must have been strange for Papa Celestin to have become a celebrity in his old age – he was born way back in 1884 – but that’s what happened in 1955 when he appeared in this film. I never knew that he’d appeared on the big screen and it’s great to see him in the flesh, even if the Cinerama format doesn’t lend itself to Youtube particularly well. He turns out to have been quite a showman and is clearly having a lot of fun in the “hold that tiger” chorus. I would love to have seen these guys play live. I bet they were a blast! The tune they’re playing is another New Orleans flag-waver called Tiger Rag. This was first recorded in 1917 by the Original Dixieland Jazz Band and its composition is credited to Nick Larocca and Larry Shields who played with that band. There is a considerable argument about who actually wrote it, and the first section is definitely taken from a dance called the quadrille that was popular in New Orleans around the turn of the century, but it’s too ancient now to matter much anyway. You can find countless renditions of Tiger Rag on record and on the net, but this is just a bit special. I hope you like it. Today’s the day we call in England Shrove Tuesday. We’re apparently all supposed to get shriven by doing a pennance before Lent . Another name for the occasion is Pancake Day, although I’m not sure what sort of pennance it is to be forced to eat pancakes. Further afield the name for this day is a bit more glamorous. Mardi Gras, which I translated for the title using my schoolboy French, doesn’t make me think of pancakes but of carnivals. And being brought up in a house surrounded by Jazz, it makes me think of New Orleans and the wonderful marching bands that played not just during the Mardi Gras parades but at just about every occasion for which they could find an excuse, including funerals. The New Orleans Mardi Gras has on recent occasions sometimes got a bit out of hand, and you probably wouldn’t want to take kids into the French Quarter for fear they would see things they shouldn’t. Personally, though, I’d love the chance to savour the atmosphere and watch the parades. The clip I’ve chosen is of Bourbon Street Parade. The one and only time I went to New Orleans I felt a real thrill walking along this street, just because I’ve heard the tune so many times on old records. I didn’t go in Mardi Gras time, however, but in the middle of summer. The heat was sweltering and the humidity almost unbearable, but the air was filled with music as well as moisture. It was impossible to sleep in the heat, so I stayed up moving from bar to bar, drinking and listening to music until I was completely exhausted. The tune was written by the late Paul Barbarin, who died in 1969 during a street parade in New Orleans. What a way to go. He also plays on the clip I included here. I picked this particular clip because it features a much underrated British musician, Sammy Rimmington (although the notes on Youtube have muddled it up; he plays saxophone on this, not clarinet). My dad once played with Sammy Rimmington and I remember the unqualified admiration with which he (my dad) spoke of his (Sammy’s) playing.